Even more compact and lightweight, with your choice of body color – black or pearl white. 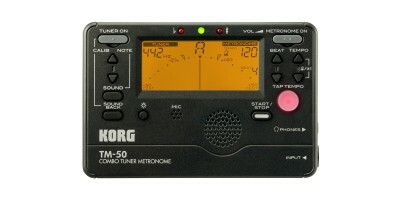 The TM-50 features extremely fast response to audio input from wind and other instruments, and the redesigned meter display method allows the pitch to be accurately and instantly shown without any time lag. Wind players will no longer experience the problem of their pitch changing spontaneously before it can be displayed accurately; this ensures that you’ll be able to develop stable and drift-free pitch. The detection range is extremely wide, extending from C1 (32.70 Hz) to C8 (4186.01Hz) which covers the note ranges of wind, string, and most other types of instruments. Even potentially difficult instruments that have a low pitch and numerous overtones can be tuned accurately, thanks to Korg’s proprietary high-precision technology. The built-in high-sensitivity mic also allows easy and accurate tuning of acoustic instruments such as guitar and ukulele; alternatively, you can use the separately sold CM-100L contact mic to send the vibrations directly to the tuner for even greater reliability. The tuner can be used not only to detect and inform you of pitch discrepancies, but also as a tool that helps you develop the ability to hear and produce the correct pitch. 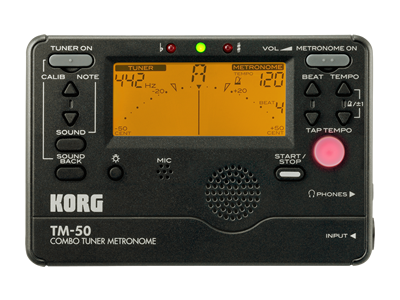 That’s why the TM-50 provides the proprietary Sound Back function* that until now has been featured only on Korg’s high-end tuners. Detecting the pitch of your audio input, this function sounds the nearest reference tone from the speaker while the meter shows the pitch difference between your input and the reference tone. Since the pitch is indicated in both visual and audible form, this not only allows you to tune more accurately, but is also an ideal method for training your sense of pitch. Developing your ear in this way is an indispensible way to practice, especially for the beginner. When performing in a brass band or orchestra, incorrect pitch is particularly noticeable for harmonic intervals of a third, yet by slightly skewing the pitch of a major or minor third interval from the equal-tempered pitch, you can obtain a more pure-sounding harmony that satisfies the ear. 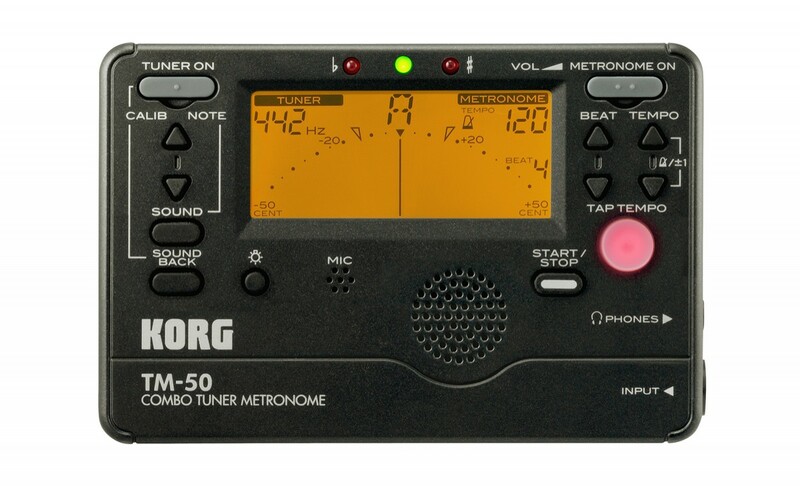 The meter scale of the TM-50 provides marks that indicate pure major and minor thirds relative to a given pitch; simply by tuning. When the needle aligns with the appropriate mark*, you’ll be able to produce beautiful harmony when playing in an ensemble. This is extremely convenient not only for wind instruments, but also for vocal or a cappella practice. *When tuning to a pure major or minor third, the note that should be adjusted will depend on the music you’re playing. Fifteen types* of rhythms are built in, including time signature numerators from 0 through 9, duplets, triplets, triplets without the center beat, quadruplets, quadruplets without the center beats. The tempo can be freely set in the range of 30–252 beats per minute. Sophisticated rhythms such as triplets and quadruplets with the center beats omitted can be useful for a diverse variety of styles including classical, rock, and jazz. 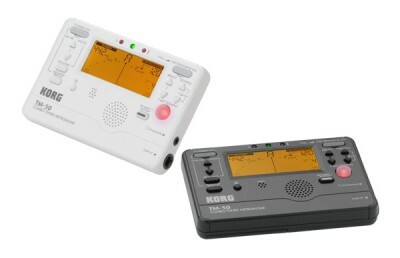 The volume can also be adjusted, so you’ll be able to use the metronome in any situation from personal practice in a small room to rehearsals in a studio. *If you’re using the tuner and metronome simultaneously, triplets, triplets omitting the middle beat, quadruplets, and quadruplets omitting the center beats will not be available. When setting the tempo, you can choose either “pendulum steps” where the tempo will increment or decrement in the same numerical steps as on a mechanical metronome, or “full steps” which allows you to specify any tempo between 30 and 252 in one-step increments. 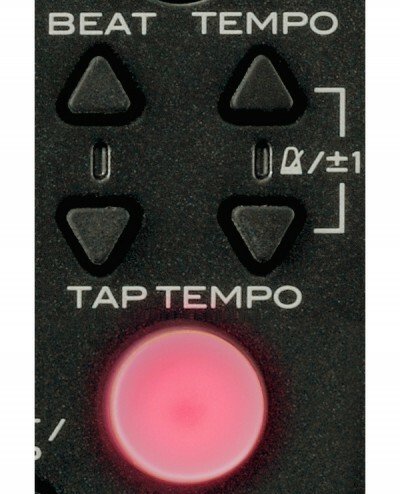 In addition, you can also use the tap tempo input to specify the desired tempo simply by pressing a switch in time with the beat. The large LCD display has a backlight that lets you adjust the brightness in two levels. In conjunction with the LED guide at the top of the display, this ensures excellent visibility, even when you’re performing on a dim stage or in an orchestra pit. The characters shown in the display are also larger for improved readability. 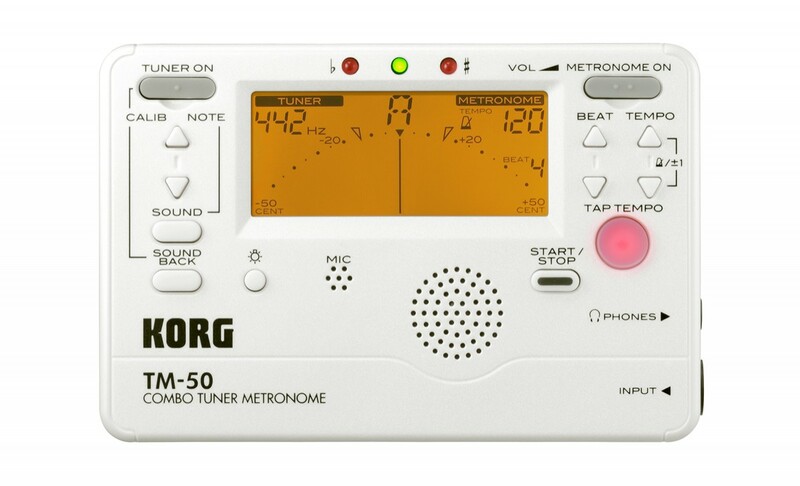 Even when you turn off the power, the TM-50 will remember the tempo, beat, rhythm, calibration, and reference tone settings that you’ve specified (these settings will be initialized when you replace the battery). 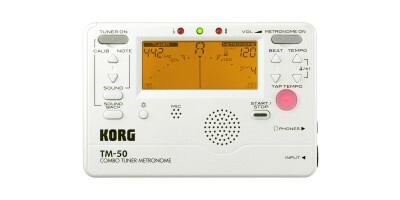 The Auto Power-Off feature will automatically turn off the power if twenty minutes have elapsed without any sound being input to the tuner while the metronome is not running.